With the iCalendar Importer/Exporter extension you can now import your reservations from popular external services including Airbnb, HomeAway and Google Calendar. This will help you to prevent double bookings keeping a room occupancy up to date with an external calendar. You can import multiple .ics files from an external service for each room. This will sync external reservations for that room. You can export the calendar of the reservations made at your website to an external service like Google Calendar. To import an external calendar (or multiple calendars) edit a room and click on the Additional settings button. Inside that panel, you will be able to insert the URL of the .ics file you want to import. A cron job runs every 15 minutes to check if there are new reservations on that calendar. Please note: only future reservations are imported. iCalendar Importer/Exporter automatically generates an iCal file for each room. You can use those URLs to export the reservations to an external service, like Google Calendar. 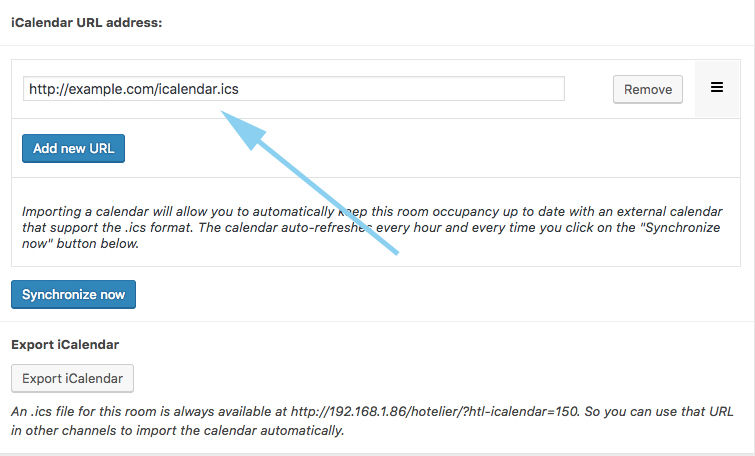 To see the URLs of your calendars go to Hotelier > Settings > iCalendar. 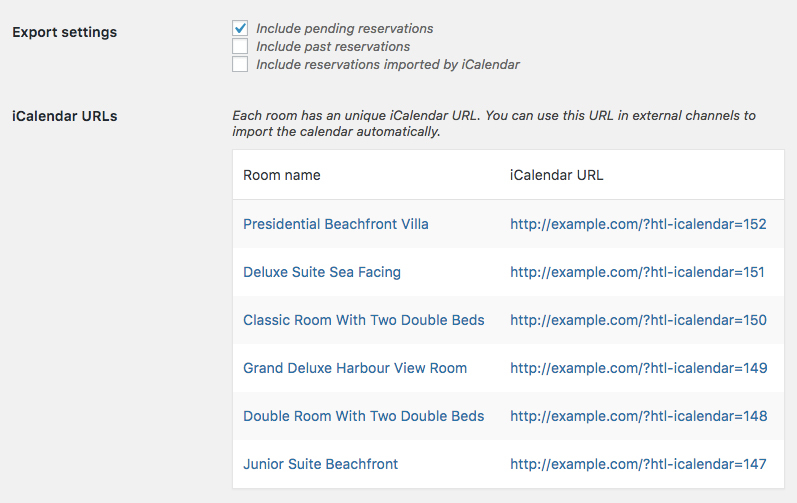 Check this option to see a log of each iCalendar import in Hotelier > Settings > Logs. By default, only confirmed reservations are export. Check this option to export pending reservations as well. Check this option to export past reservations. Reservations imported by iCalendar are not exported. Only those created at your website with Easy WP Hotelier. Check this option to include them. Please remember that WordPress crons are not real cron jobs. They are executed every time someone loads a page. To replace WordPress crons with a real cron job follow this tutorial.